At Luna Farms, we strive to continue practicing the management methods for our small farm. This includes cover crops, which are rotated and incorporated to return nutrients back into the soil, increase organic matter, reduce weed pressure and provide an additional food resource for beneficial insects and native pollinators. It remains a priority to maintain this balance through a whole system approach to control or prevent outbreaks of disease or insects that could negatively impact productivity. 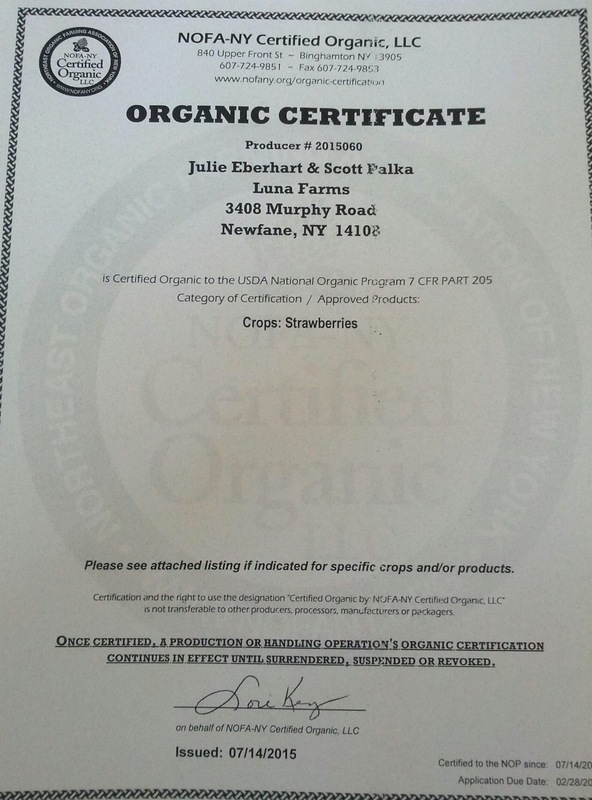 All of the products used on our farm as fertilizers or pest controls are approved by the accrediting agency, NOFA-NY, Northeast Organic Farming Association of New York. Winter provides an opportunity to read and learn the best practices for cultivation; sections of the farm have been planted with native flowers to bloom at various times of the growing season in hopes of providing continual food for a variety of insects and birds. Bluebird nesting boxes are placed in close proximity to growing areas to glean insects from plants and provide an additional food source for developing nestlings. Areas are left undisturbed to prevent destroying native pollinator nests and food sources.